Okay. Truth be told it was more like 28 hours, but that doesn’t have quite the same ring to it. Most professional photographers keep strange hours. While most people are enjoying the weekend… we’re working it. This might sound like a complaint, but it’s not. As a photographer, working on the weekend is simply a part of the job, and just like musicians, actors and other performing professionals know – it’s worth the price of admission to be able to go wherever our job takes us. So here is a snapshot (sorry) of the first weekend in December 2014. Starting things off at 11am Saturday morning – it’s the last home game of the season for UCONN Football. SMU Mustangs’ Shelby Walker grabs an easy pass for their second touchdown of the day against the UCONN Huskies. Right. 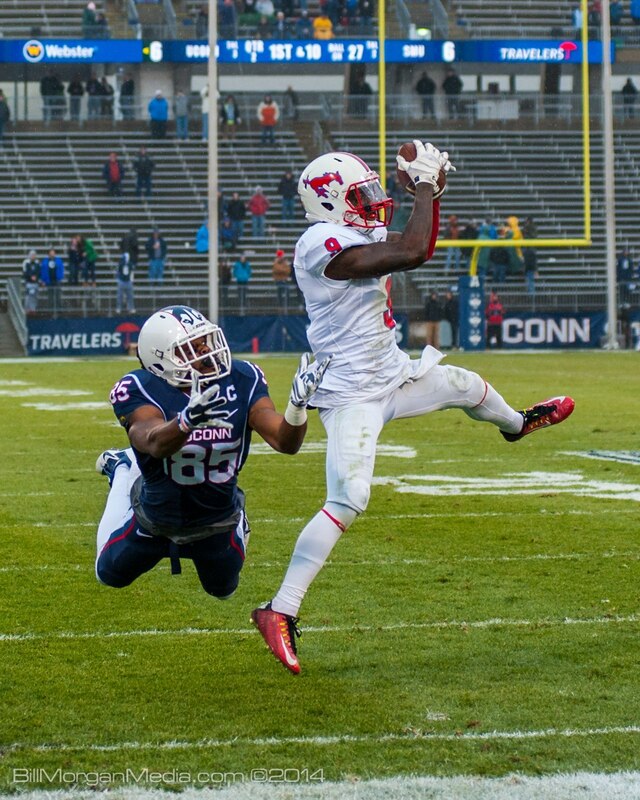 This picture rather nicely sums up the UCONN football season. It was supposed to be an easy win – even for the Huskies. Yet a (previously) winless SMU seemed to take advantage of every UCONN blunder on the field, going on to take home their first and only victory in 2014. And while beleaguered UCONN fans were saying that the end of the football season couldn’t come soon enough, for the venerable UCONN Marching Band it was the conclusion of another spectacular season of highly entertaining field shows and blasts of spirit from the stands. The UCONN Marching Band performs their traditional rendition of Battle Hymn during the pre-game show. Hats off to the Seniors of the UCMB! For many, this was their last hurrah and an emotional end to their time as a student in the UCMB. It’s been a privilege to document your season, and hopefully we’ll get to see you next year as members of the UCMB Alumni Band. After spending a rain-soaked afternoon with the Huskies, I got to warm up with the Hartford Independent Chamber Orchestra as they presented their second concert of the season. This performance featured works by Connecticut composers Jessica Rudman, Ken Steen, Frank Vasi, Robert Carl and Ryan Jesperson. 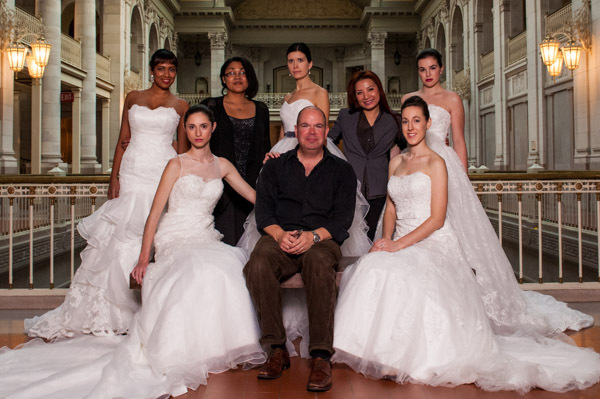 Bright and early Sunday morning I headed into Hartford to meet with stylist Yemisi Rose and one of the five models that would be wearing bridal fashion by Connecticut designer Annie Nguyen. 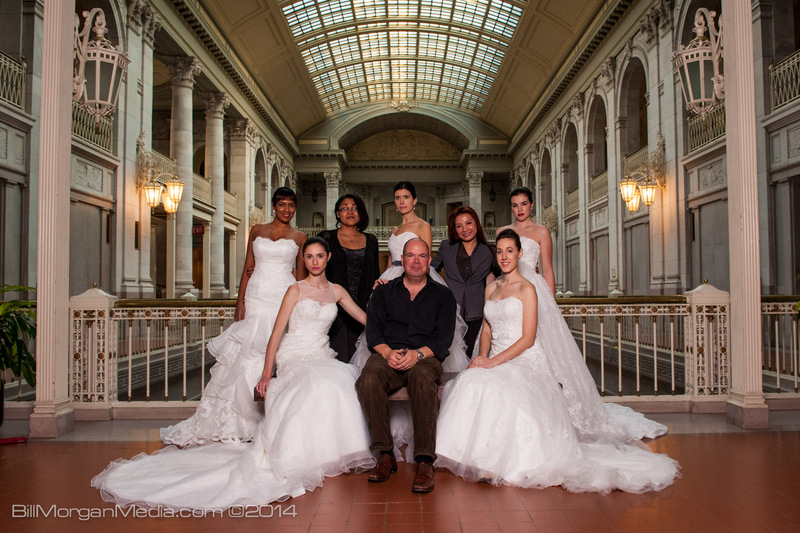 Since time was short for this fashion shoot, we needed to get our first model into hair and makeup even before we could set up in the beautiful Hartford City Hall which would provide the backdrop for this shoot. Seven hours later… it’s a wrap on the weekend. Time to offload a couple thousand shots onto my computer, and enjoy my (unexpected) reward for the day – Robin’s homemade pulled-pork and coleslaw sandwiches. Lucky guy I am!